Carolyn Forche recites her poetry at SummerWords on May 30. Forche is an internationally renowned, award winning poet. 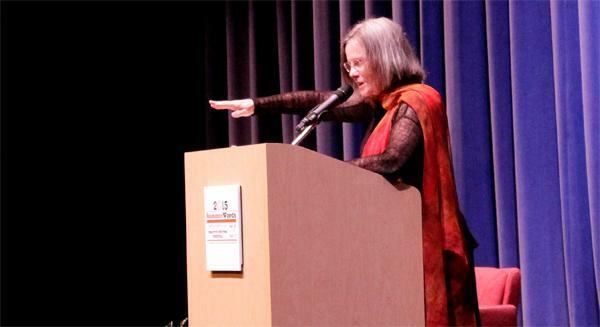 Internationally renowned award winning poet Carolyn Forche was the keynote speaker on the last night of the SummerWords creative writing festival at American River College last month. Forche’s poetry touched on many topics, from childhood memories of her grandmother, an immigrant from Czechoslovakia, to her first hand experiences of the civil war in El Salvador. Forche was introduced by English professor Harold Schneider. Forche was born in Detroit, Michigan. The first poems she read recalled her childhood in the 1950s and 60s. She said she tries to include a poem on her grandmother in each of her poetry books. “I feel her behind me when I’m writing and if I haven’t written of her yet, I hear her say ‘I want to be in the book,’” said Forche. She then moved to international topics, reading ‘Dancing in Odessa’ and ‘Pushkin Poem’ by Ilya Kaminsky, a Ukrainian poet and friend of Forche’s. Forche spoke about the civil war in Yugoslavia in ‘Letter to a City Under Siege.’ That poem was inspired by the Siege of Sarajevo in the mid-1990s. Forche recited her poetry for a little under one hour. The keynote was followed by a book signing by Forche and a dinner outside the Student Center for SummerWords participants. Be the first to comment on "Internationally renowned poet concludes SummerWords event"